Coffee is an essential part of my day, especially as a busy working parent. However, coffee is typically served hot. In the Summer months, this seriously puts a damper on my coffee needs. You know, what with my want to avoid any and all additional forms of heat and all. Here’s where I let you in on a little secret of mine. 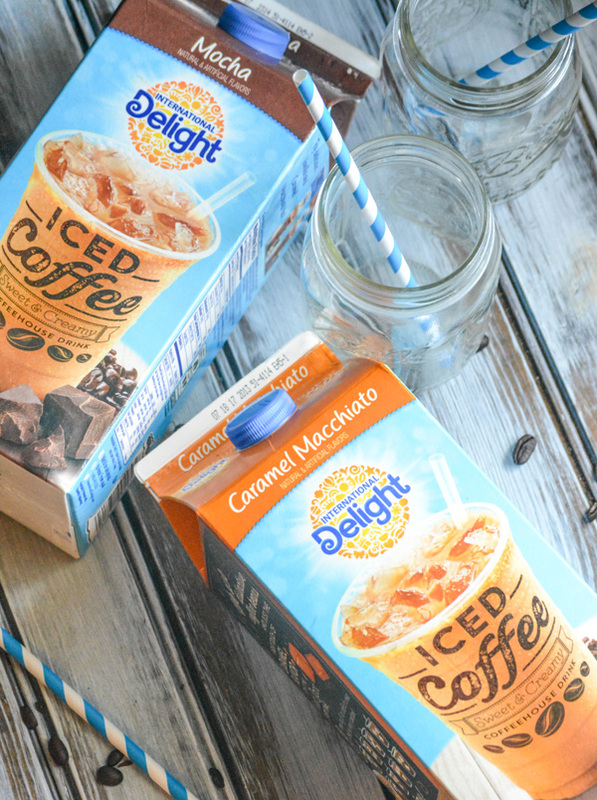 International Delight® Iced Coffee. Seriously, this stuff is so dang delicious it tastes like I’m sippin’ on dessert. In the AM. On a Monday, when I’d really rather be back in bed with my fan blowing in my face. It’s the next best thing to cool off with, and makes being awake pretty worthwhile. It’s just as refreshing in the afternoon and evening, sitting in the shade and watching the kids play or even paired with a good book. My two favorite flavors are the Mocha and Caramel Macchiato varieties. Mocha is the perfect equation, coffee + chocolate = delicious genius. The Caramel Macchiato is a yummy classic combination. Both are ready to drink, right from your own fridge. Cheaper and easier than the coffee house in the Summer with kids. All you need is a clean glass. Fill it with ice, pour, and enjoy your own little refreshing piece of paradise. Didn’t think it could get any better than this?? What if I told you you can also use it as an ingredient when baking to whip up a tasty treat that’s infused with your favorite flavors? This is not a drill. I repeat this is NOT a drill. 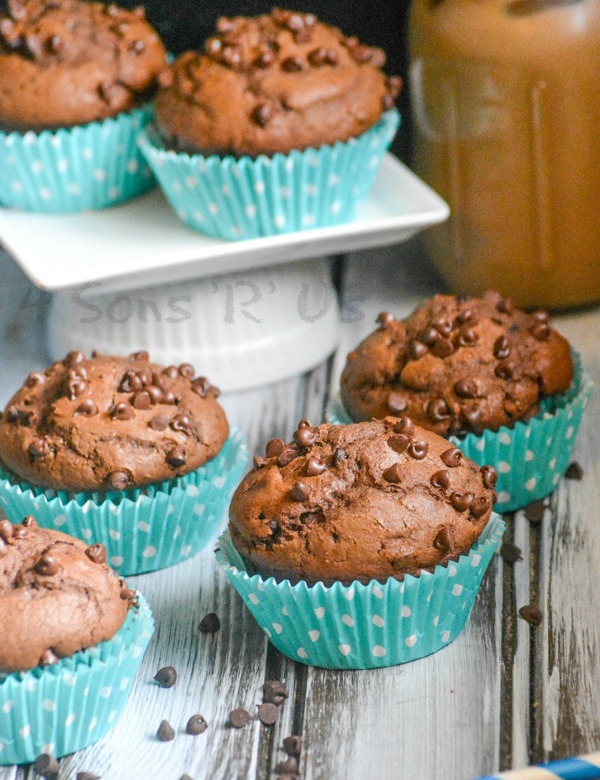 Which is exactly how we got these amazing Chocolate Chocolate Chip Mocha Muffins. Sit down and savor them with a cold glass of iced coffee, or pair it with your favorite tervis, grab and go. 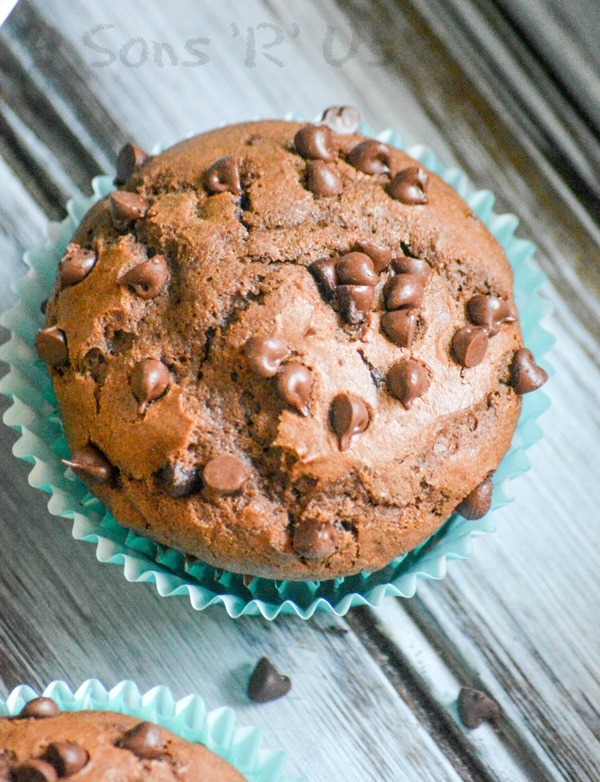 Chocolate Chocolate Chip Mocha Muffins — they’re perfect for snack time savoring, or for making ahead and enjoying a cool treat on a warm morning. Infused with Mocha flavor, these muffins taste like they were just ordered from your favorite gourmet bakery, not fresh out of your own oven. 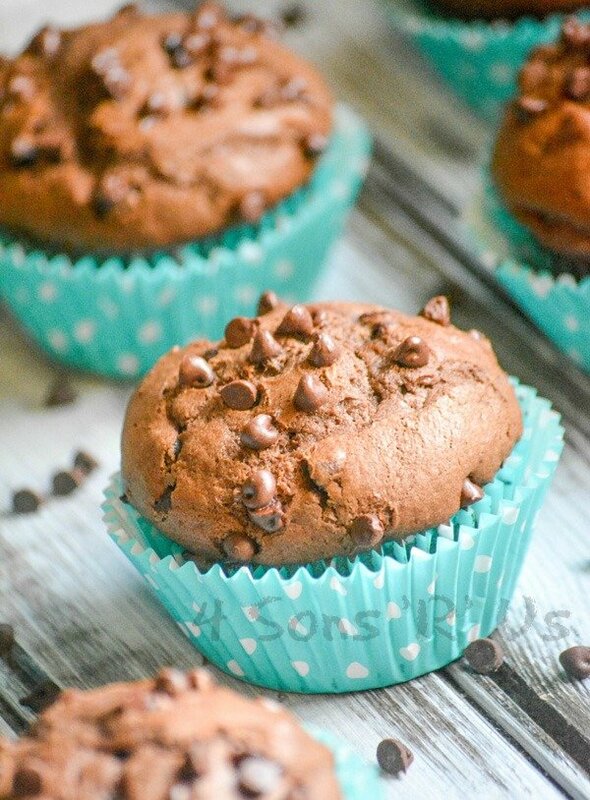 These moist chocolate muffins get their unique flavor from a combination of mocha flavored coffee and heaping helping of cocoa powder. 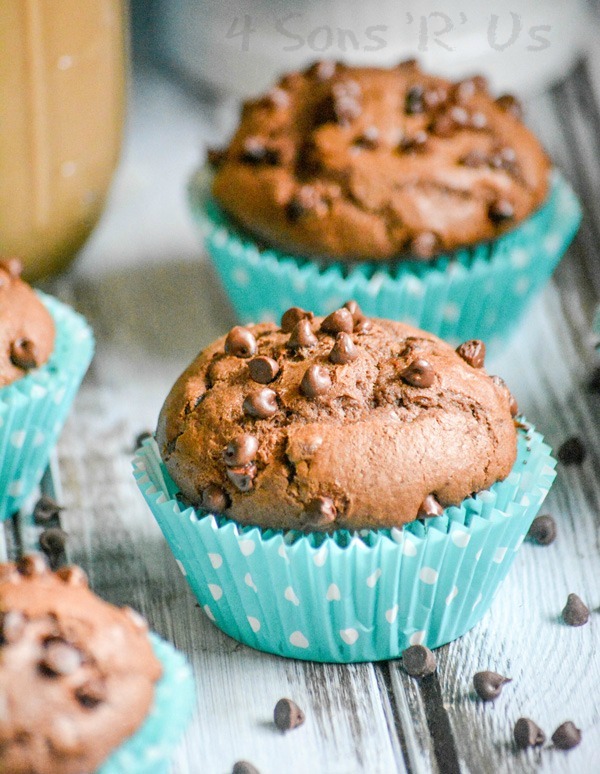 Studded with chocolate chips, with a few extra sprinkled on top, they’re the real deal. Skip the coffee house this Summer. 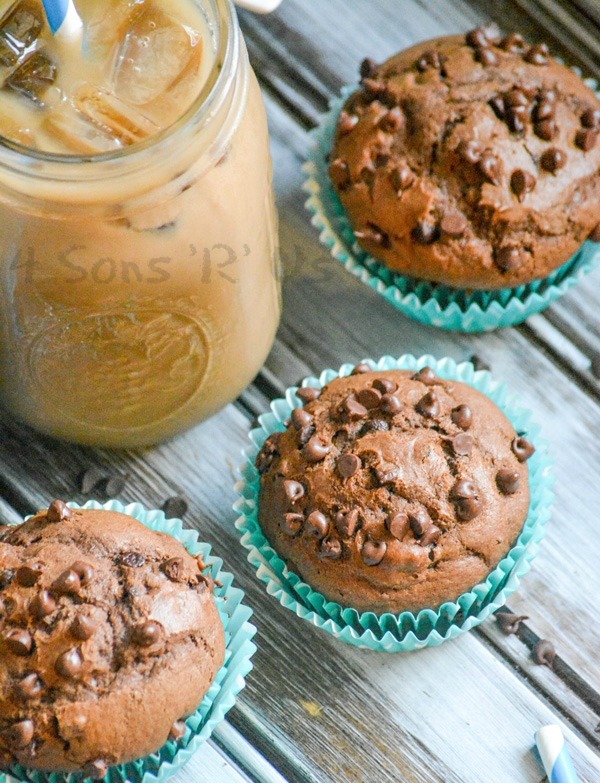 Avoid the kids squabbling in the car, and enjoy the savings while you still get your fix– sipping on an ice cold gourmet coffee while enjoying a bakery style muffin. 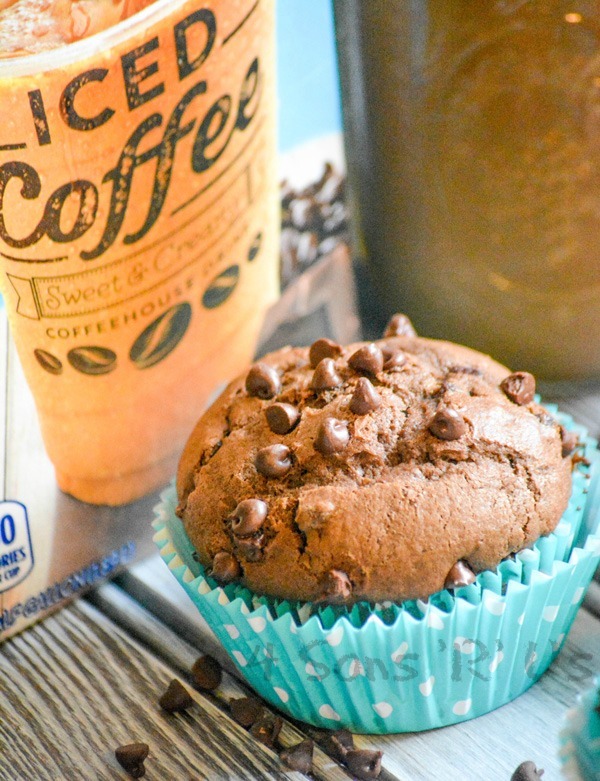 Nothing pairs with a cup of coffee like a moist double-chocolate grab and go muffin. In the bowl of a stand mixer, cream together the butter and sugars until light and creamy. Beat in the egg, sour cream, and vanilla until evenly incorporated. In a separate bowl, add the dry ingredients. Use a fork to stir them together until they're evenly incorporated. Alternating between the two, mix the dry ingredients and the coffees into the muffin batter. Beat just until the batter has evenly come together. Use a spatula to fold in 3/4 cup of the mini chocolate chips. Spoon the batter evenly into sixteen lined cupcake pans. Sprinkle the tops with the remaining chocolate chips. Bake the cupcakes at 400 degrees for 16-18 minutes. Remove the cupcakes from the oven. and let them rest for 5 minutes. Remove them to a wire rack to finish cooling completely before serving. 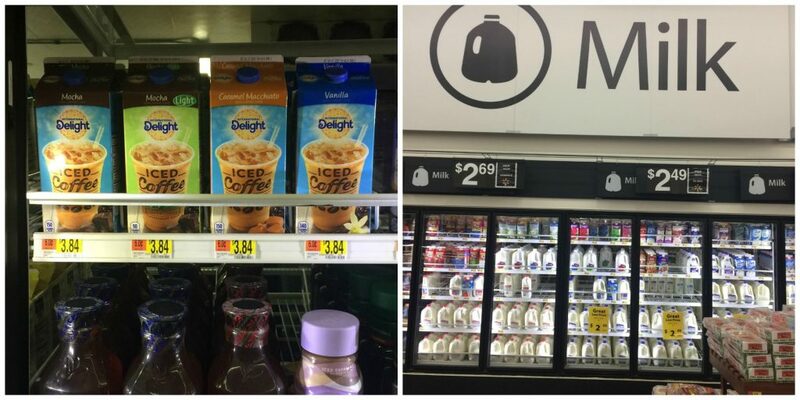 You can find International Delight® Iced Coffee in the Dairy section of your local Walmart. Discover which of their yummy flavors is your favorite. And be sure to check out these other awesome ideas for some inspiration on how to incorporate more ‘delight’ into your day. Same here Carolyn, and this one didn’t disappoint. Fabulous flavor combo! These look wonderful! Wow! These look really good! Thank you for partying at Fiesta Friday. 🙂 Have a lovely week ahead! They do look great! I don’t think I can find that brand of Iced Coffee in Germany, however, I’m sure there is some kind of replacement. Will start to look, thanks for the recipe! Oh, I’m sure there’s something. I’d love to know what you end up using.